Annie’s Resource Attic » Blog Archive » Animals Game And More! Although the original Animals Game appeared in 2008, the Animals activities and resources added in 2019 turn a light lunch into a feast, so I’m making it a whole new post! Added features include all-new artwork, online and desktop versions of the two books, re-written PDF format books using the new artwork, a much-expanded and upgraded clip art collection, a large video collection, a bonus sound collection, and puzzles both online and printable. Let’s start with the main course, The Animals Game. The Animals Game is a fun science activity, in which students pick an animal from a chart of 28 possible choices, and the computer tries to guess its name. It’s really a test of the student’s grasp of animal characteristics, but with a twist so that the student runs the show. Students answer questions yes or no, and must display quite a bit of knowledge about animals to help the computer quickly close in on the answer. In the online and desktop versions, students can run a short video to see the real animal in motion. This is a fun way to learn how to classify animals by their characteristics, and to begin to associate animals that share a given trait. Students will enjoy repeating this activity many times! The online (and desktop) version of the game had no file size restrictions, so I was free to add special touches. For these 2019 versions, I re-drew the art for all the clues, the little computer cartoons, and all the animals, so that the look and feel of the game is much richer than the earlier versions. Of course, all versions of The Animals Game include animals from many different groups; land and ocean animals, vertebrates and invertebrates, carnivores and herbivores, and so on. There are mammals, birds, reptiles, amphibians, fish, insects, crustaceans, and arachnids, to name a few. The computer in the online version has a distinctive voice to speak the text aloud, and it has developed a personality. I’ve given it some “thoughty” um’s and uh’s to convey how hard it’s thinking, and varied its reactions when it figures out the answer. The Yes and No buttons also speak aloud, making the interaction more like a real conversation. 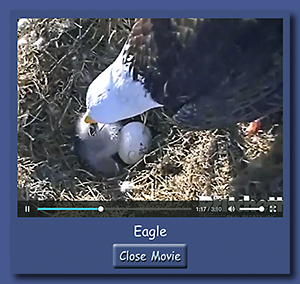 I’ve added one other new element to the online version: short videos of each animal to view at the end of each round. These videos are a bit longer than I usually add to stories, but still very short: 1 to 2 minutes tops. By combining short clips, I got a lot of information into a short timespan. For example, in the spider video you see how it coordinates all those legs in walking, watch baby spiders hatch, watch it capture and speed-wrap bees, and marvel as it carefully constructs a web, all in just under a minute. These videos are meant as a reward for successfully guiding the computer to the correct answer. Students are welcome to watch all or part of any of them, or skip them if they prefer. Their other choices, after the computer makes a guess, are either play another round or stop for the day. I predict they will usually play again, unless they have gotten fascinated watching the video of a particularly interesting animal. With only two buttons on a page, The Animals Game is an excellent content-rich activity for students who use alternative access, including switches. 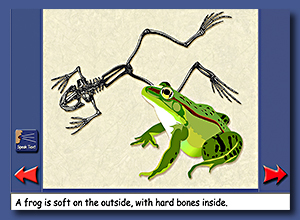 This non-linear activity is available online, as a desktop book, in PDF format, and there are legacy versions (with the old original art) in IntelliTools Classroom Suite® and Clicker 5® formats. The PDF version can be used on the computer, or printed out as a 50 page book and used as a classic choose-your-adventure book. The online and desktop versions (but not the PDF) include videos. All three of these formats include the new artwork. There is an IntelliKeys® overlay, and a Dynavox® version of it, to use with the legacy Classroom Suite version. See the Special Needs Access section on the System Reqs page for information on controlling the Classroom Suite version from PRC devices. 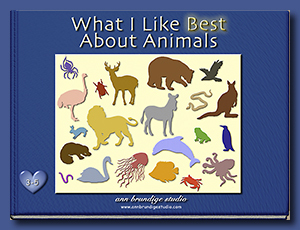 The supporting book, What I Like Best About Animals, is a straight-line narrative that also teaches students about the characteristics of various animal groups. It is a good prelude to The Animals Game, introducing many of the traits students will need to consider in playing the more complex game activity, so I’ve placed it first on the menu. Since it’s at a simpler reading level, What I Like Best About Animals could also serve as an alternative assignment for students for whom The Animals Game is too difficult. This activity is available in online and desktop versions, PDF format, and legacy versions (with the old original art) in Classroom Suite, Clicker 5, My Own Bookshelf®, and PowerPoint®. For the Classroom Suite version, there is an IntelliKeys overlay, and a Dynavox package version of the overlay. There is a comprehension test to download for What I Like Best About Animals in PDF format (with the new artwork), Test Me Score Me®, Classroom Suite, Clicker 5, and Microsoft Word® (Word 97-2003 and Word 2007 Vista) formats. The PDF format test can be worked on- or off- computer, and could follow the online, desktop, PDF, or PowerPoint versions. There is also a Cloze Pro® activity for this story. The desktop version of the two books is a single zip file, and be warned: it’s over 400MB because of the many videos. Printable items are all in a single zip file, including PDFs of the comprehension test, The Animals Game, and What I Like Best About Animals. There also is a download of the comprehension test alone, since you might want to use it with the online, desktop, or PowerPoint versions. Similarly, The Animals Game, What I Like About Animals, and the comprehension test activities are a single zip file for Classroom Suite. The three Dynavox versions of the overlays are a separate, single zip file to download. For Clicker 5, the single download for all three activities (book, game, and test) is an integrated study unit with a menu grid, and the entire folder must be copied into the Clicker 5 Shared files. For details on integrated study units, click here. Download a single zip file with a Teacher’s Guide, the story scripts, test key, a flow chart, the Animals Chart, and a chart of Animal Alternates. I’ve included suggestions for extension activities in the Teacher’s Guide. The flow chart, which displays the entire logic tree of the activity, and the Animals Chart, which displays the array of 28 animals from which to choose, may be helpful in explaining the game to students and also for extension activities. The Animal Alternates chart includes substitutions you could make to swap in other animals, to keep the activity fresh. Animals Clip Art – One of my goals in re-drawing all the artwork was to create a more complete clip art collection. All the animals are original art or adapted from public domain images, and they come in at least two sizes.The clip art collection also includes all the poses of the little computer cartoon, with its various expressions, the stage and easel with several different lighting schemes, and miscellaneous art elements such as the water splash from the dolphin picture, button faces, and a spiderweb. Animals Videos – On each of The Animals Game pages where the computer idetifies the chosen animal, there is a Play Movie button that opens a floating page with a video (or in some cases several videos) that shows the real animal in action. Each short video is a combination of several short clips, chosen to display as many different aspects of each animal as would fit into a couple of minutes at most. A list of the credits for each clip is included as a PDF along with the collection, to make it easy for you to use them in new activities. There are thirty-three videos in the collection, since there are two for lions, two for camels, and three for turtles. That means a very large download, but this video library is worth the wait! Animal Sounds – I stumbled on this sound collection while searching out animal movies. While it’s not officially part of the Animals activities, it fits right in for further exploration of the animal world. I’ve divided them into folders of bird sounds, mammals, and reptiles and amphibians, plus a separate folder of a few sounds I edited. Altogether, these three collections are so valuable, completely apart from the Animals activities, that I’ve made a separate post about them. There are download links on this page, and for more information and previews, see the Animal Resources post. I couldn’t resist making three online puzzles, using illustrations from What I Like Best About Animals. One of them uses the picture on the last page, with all twenty animals mentioned in the book, so it’s 20 pieces. The other two are 12 piece puzzles, the beautiful jellyfish, and a scene with the platypus watching over two eggs in its nest. The three links are on this page. You can also download printable versions of the same puzzles to use off-computer. Applications needed: Any modern web browser, Acrobat Reader, Clicker 5, Cloze Pro, IntelliTools Classroom Suite, My Own Bookshelf, Test Me Score Me, PowerPoint, MicroSoft Word. Levels: Grades 4-5 (Animals Game), 3-5 (What I Like Best…). Animals Menu link: animals/index.html Menu leads to two activities to read online. The first activity, the What I Like Best About Animals book, is an introduction to the diverse characteristics of animals. 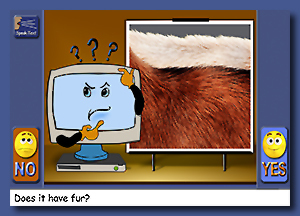 In the second activity, The Animals Game, the user gives the computer clues to guess a chosen animal. Text reads aloud from a button. HTML5 format and updated movies and sounds run in modern browsers, including on phones and tablets. On iPad, you must click the Play Sound button. For details on using Annie’s Books Online, click here. Desktop version of the Animals Activities link: animalsDesktop.zip (486 MB) What I Like Best About Animals book and The Animals Game (including the videos) to read from the desktop using a web browser. Text reads aloud from a button. HTML5 format and updated movies and sounds run in modern browsers, including on phones and tablets. On iPad, you must click the Play Sound button. Not for pre-IE9 browsers. For details on using Annie’s Desktop Books, click here. Animals Puzzle link: CLICK HERE. 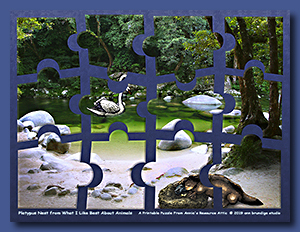 Animals 20 Piece online puzzle. Image is 20 animals, from a small earthworm to a big bear, from the What I Like Best About Animals book. Jellyfish Puzzle link: CLICK HERE. Jellyfish 12 Piece online puzzle. Image is an orange jellyfish drifting in deep blue water from the What I Like Best About Animals book. Platypus Puzzle link: CLICK HERE. Platypus 12 Piece online puzzle. Image is a platypus with its nest and two eggs from the What I Like Best About Animals book. PrintableAnimalsActivities.zip (24.9 MB) Both Animals activities to print or use on the computer, in PDF format. No movies. Acrobat Reader. AnimalsTest2019.pdf (2.0 MB) comprehension test in PDF format on What I Like Best About Animals book to use with the online, desktop, and PowerPoint versions of the book. Use this test on the computer or print it out and work off-computer. This version of the test has the same questions as the legacy versions below, but has the new artwork. No need to download this test if you download the PDF versions of the books (above); this test is included in the download. Acrobat Reader. AnimalsPrintedPuzzles.zip (6.3 MB) Three puzzles in .jpg format with images from What I Like Best About Animals to print, mount, cut apart, and use off-computer. Animals (20 pieces), Jellyfish (12 pieces), and Platypus (12 pieces). These are the same pictures as the three online puzzles. Graphics app that can open a JPEG image. TeacherMaterials.zip (3.5 MB) Bundle of teacher materials to print. Teachers Guide and Credits (PDF), story scripts, test key, note about the alternatives chart (.rtf), and three JPEGs: Animals Chart, Flow Chart, and Alternative Animals Chart. Apps needed: Acrobat Reader, Graphics app that can open a JPEG image, Notepad or other text reader. For more information about these downloads, see the Animal Resources post. AnimalsClipArtCollection.zip (44.8 MB) Collection of clip art in .jpg and .png formats, including all the animals from The Animals Game (and a few extra), the little computer cartoons, and more. To preview the collection, click here. AnimalsGameVideoCollection.zip (424 MB) Collection of short videos featuring each of the animals from The Animals Game in .m4v format, compatible with modern web browsers and apps such as Windows Media Player® and Quicktime®. USFWS_Sounds.zip (35.6 MB) A collection of animal sounds from the U. S. Fish & Wildlife Service website. This collection of sounds includes unusual ones such as the sound of a whale spouting, a woodpecker tapping, and an alligator bellowing. Most sounds are in both .wav and .mp3 formats, and a few that I edited are also in .ogg. AnimalGameClick.zip (6.4 MB) Unit includes The Animals Game, What I Like About Animals, Show What You Know About What I Like About Animals, and a menu grid with links to the three activities. Decompress the zip file, and copy the entire folders into Clicker 5. When student clicks on the folders from Clicker Explorer, the menu grid will open. AnimalsCloze.clz (6.7 KB) Tests comprehension by using the text from What I Like About Animals in a Cloze Pro activity. AnimalsSuite.zip (18.1 MB) The Animals Game, What I Like About Animals, and the comprehension test in Classroom Suite v.3 or later. Custom IntelliKeys overlays attached. Can be run from PRC devices. AnimalsDynavox.zip (137 KB) The Animals Game, What I Like About Animals, and the comprehension test overlays saved as Dynavox package files. AnimalsPowerPoint.zip (2.4 MB) What I Like About Animals book saved as a .ppt file. PowerPoint 2003 or later. WhatILikeAboutAnimalsSoft.zip (4.1 MB) folders with What I Like About Animals book to import into My Own Bookshelf. WhatILikeAboutAnimalsTestSoft.zip (2.9 MB) Test on What I Like About Animals story using clip art for answers. Requires Test Me Score Me. 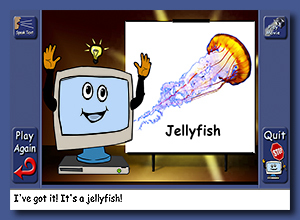 WhatILikeAboutAnimalsTest.doc (1.2 MB) Test on What I Like About Animals story using clip art for answers. Print out or fill in letter answers on the computer. Open in Microsoft Word 97 or later. WhatILikeAboutAnimalsTestVista.docx (974 KB) Test on What I Like About Animals story using clip art for answers. Print out or fill in letter answers on the computer. Open in Microsoft Word 2007 or later. This version was saved from Vista, because I had some layout problems when I opened the Word 97-2003 version in Vista running Word 2007. My rural school district is in financial duress and we cannot afford to update our computers to Windows 7. I am looking for classroom suite 3 disks that I can purchase. Can you help me out? Ella, I don’t know where you could buy Classroom Suite v. 3 disks, but you may not need them. It sounds like you are under the impression that Classroom Suite v. 4 requires Windows 7. That’s not so. While v.4 CAN run in Windows 7, it certainly will run in earlier versions of Windows as well. The requirements listed on the IntelliTools web site are: “Win 2000, XP (excludes XP 64 bit Edition), Vista, [and] Windows 7”. So most likely Classroom Suite 4 will run on your current computers. The description goes on to say Classroom Suite 4 will not run in the 64-bit versions of XP, Vista, or Windows 7. 64-bit XP was something of a specialty system, not widely sold, but newer Vista versions are 64-bit. You can determine if your copy of Vista is 32 or 64 bit by opening the System window in the Control Panel. It will state that the system type is either 32 or 64 bits. For XP, again open the System window in the Control Panel. Under the General tab, it will say Windows XP (Home or Professional) Edition Version (year). If it’s 64 bit, it will say Windows XP x64 (Home or Professional) Edition Version (year). Of course, the easiest way to make sure the current version of Classroom Suite runs on your computers is to download the 30 Day free trial from the IntelliTools web site and try it out.